Motion at the foot and ankle is important for normal walking, running, and many other daily activities. The foot and ankle has tri-planar motion, meaning it must move in multiple directions to adapt to different surfaces. Ankle sprains often involve the ligaments on the outer ankle, most commonly the Anterior Talofibular ligament (ATFL). These ligaments are important for providing strength and stability to the foot and ankle region. 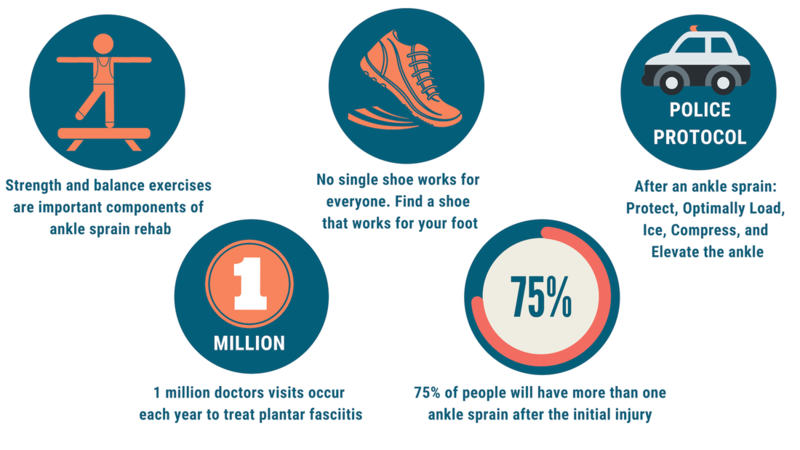 Plantar Fasciitis is the most common cause of pain on the bottom of the foot. Many people with foot and ankle issues will often have a recurring episode of pain later in life. This needs to be changed! If you recently had an injury, it is important to quickly decrease your symptoms so that normal movement can return. Then, focus on the strength, flexibility, and balance so that you can return to the activities you enjoy most! Go to the Plantar Fasciitis Self Treatment Program Now!